Sophomore Charles Mann scored 18 points, including the go-ahead basket with just over 35 seconds to go in overtime, to lead the Georgia Bulldogs in an upset on the road at the No. 21 Missouri Tigers 70-64. The win was bittersweet for UGA head coach Mark Fox, whose father passed away on Saturday. 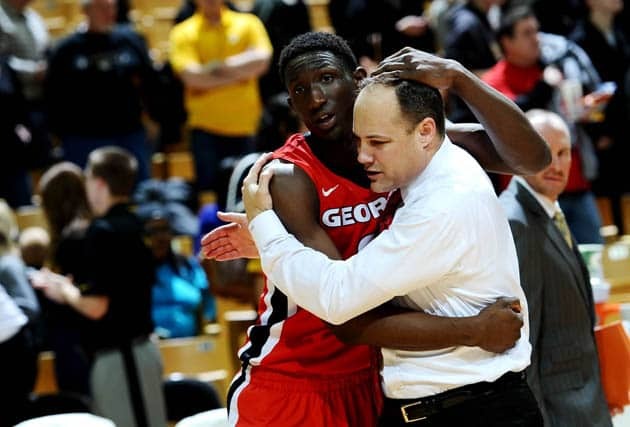 When Fox realized his struggling Bulldogs had sealed the victory, he broke down in tears as he sat on the UGA bench. After the final buzzer sounded, his players hugged him, and some of the Missouri staff and players did also. The win was also big for Georgia because it broke Missouri’s 26-game winning streak at home, which was the nation’s longest. Missouri also had an RPI of 26 compared to Georgia’s 259. Georgia led Missouri by as many as ten in the first half and took a 30-25 lead into the half. It only took a little over five minutes into the second half before the Bulldogs surrendered that lead. With just over a minute remaining, Georgia held a three point lead, but Charles Mann missed two free-throws that could have put the game away. A Missouri three-pointer with :53 remaining ultimately sent the game to overtime. In the extra period, Nemanja Djurisic scored the first seven points before Charles Mann scored the deciding basket. Mann finished the game with 18 points, six rebounds, and four assists. Djurisic came off the bench to score 16 points and grab five rebounds. Kenny Gaines and Brandon Morris added 11 and 10 points respectively. Georgia finished the game shooting 43.3 % (26-of-60) to Missouri’s 39.3% (22-of-56). The Bulldogs were 31.3% from three-point range (5-of-16) and were again bad at the free-throw line (13-of-26). With the win, the Bulldogs improve to 7-6 overall and 1-0 in the SEC. The Bulldogs return home to host Alabama on Saturday afternoon (4pm ET, SEC TV/ESPN3).